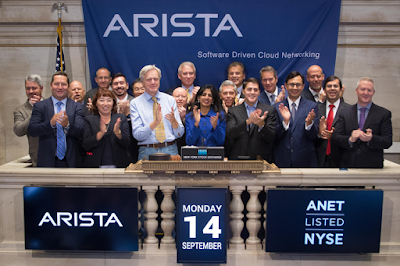 Arista Networks introduced its new line-up of data center switches for 25/50/100GbE switching. 7060CX-32S - offers multi-speed 10/25/40/50/100GbE on all 32 ports in a 1RU leaf switch along with flexible L2 and L3 features and wirespeed performance. 7260QX-64 - 64 ports of 40GbE in a compact 2RU system with low latency and power per port of under 5W per port. 7260CX-64 - delivers a new standard for 100GbE port density within a fixed form factor chassis offering 64 line rate 100GbE interfaces in 2RU. 7320X-32C - brings high density 40/100GbE connectivity options to the 7320X series of modular switches with 32 ports of 100GbE for a total of 256 ports of 100GbE per system. 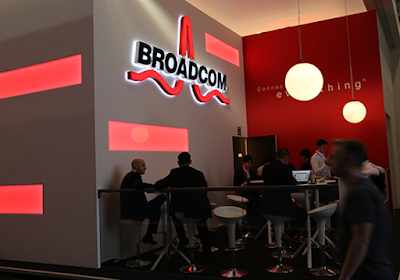 Each port can support a choice of 100GbE, 40GbE, 2x50GbE, 4x 10GbE or 4x 25GbE. 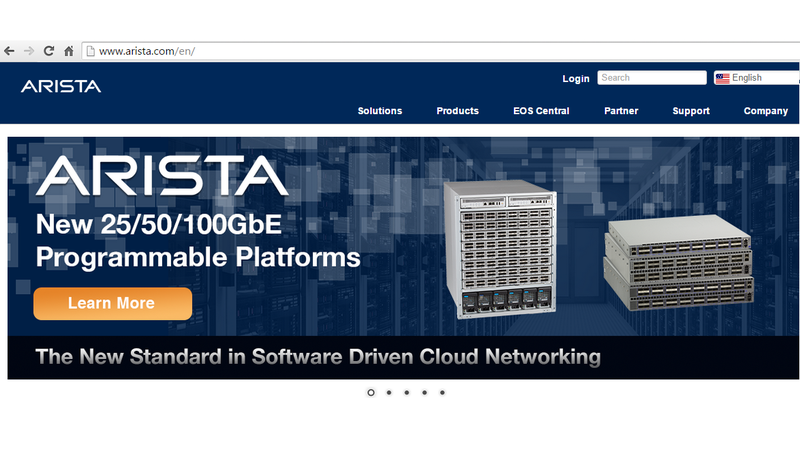 New 7050X fixed switch models are the 7050SX-72Q and 7050TX-72Q that offers a flexible combination of 48 10GbE ports with 6 QSFP+ 40GbE ports that are both power efficient and low latency with support for wire speed VXLAN routing. 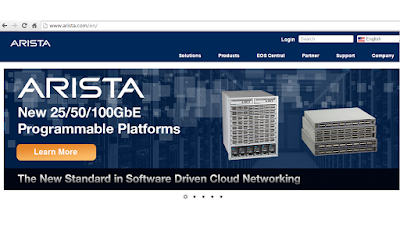 Significant, Arista said pricing for the 7060X and 7260X start at under $1000 per 100GbE port. Arista also announced availability of new optics at both 40G and 100G including an industry compatible 40GbE BiDi transceiver that operates over multi-mode fiber and a choice of cost effective solutions for 100GbE connections for server to leaf and leaf to spine connections including Active Optical Cables, 100GBASE-SR4 and 25GbE breakout cables. 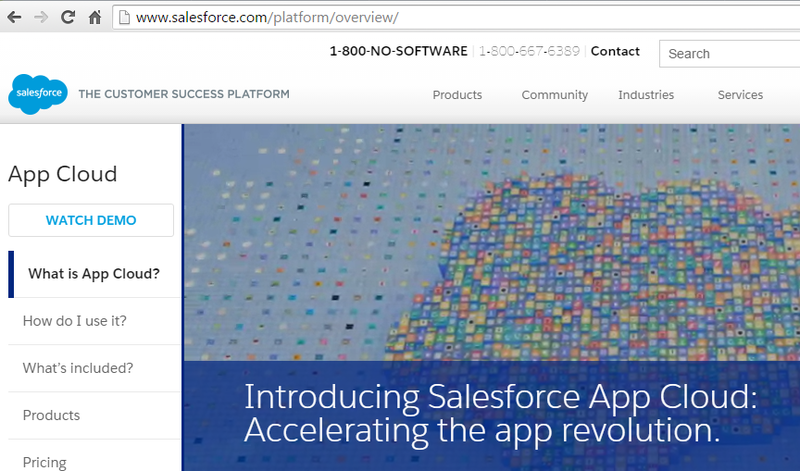 Salesforce introduced the next evolution of its core platform -- Salesforce App Cloud integrates services including Force, Heroku Enterprise and Lightning along with new shared identity, data and network services. The tools enable developers "to build apps fast in any language they want, for any device, and manage them in a single enterprise cloud environment." Salesforce is also adding a new interactive learning environment called Trailhead and AppExchange, which the company says is the largest enterprise app marketplace in the world. alesforce pioneered the enterprise Platform as a Service market when it launched the Force platform in 2008. And today, Salesforce is the leading enterprise PaaS. The company said its new App Cloud extends the enterprise Platform as a Service (PaaS). Heroku Enterprise—Private Spaces, Regions and Identity: enables developers to create connected apps using network, data and identity services shared across the App Cloud. Enterprises can run apps in a dedicated Heroku private space with direct access to Salesforce's trusted infrastructure and to customers’ on-premise data from legacy systems. With Regions, companies can choose to run their apps in metro areas throughout the world--including Dublin, Frankfurt, Singapore, Sydney, Tokyo, Northern Virginia and Oregon--based on accessibility, compliance or other requirements. In addition, with Identity, Heroku Enterprise is connected to Force with bi-directional data sync, single sign-on and robust role-based access controls. 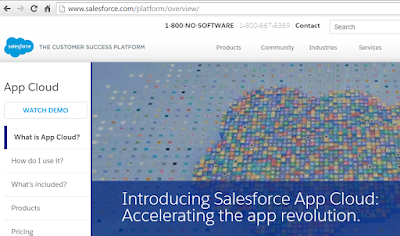 Salesforce Lightning—The Future of Modern Apps: a new metadata-driven platform service that is highly customizable, with drag and drop components, such as maps, calendars, buttons, and number entry forms. Trailhead—Interactive Learning for All Salesforce App Creators: App Cloud includes Trailhead, a new interactive learning environment with gamification features. Chunghwa Telecom, Taiwan’s leading service provider, is to commence the world’s first commercial deployment of G.fast ultra-broadband access technology. Alcatel-Lucent said its G.fast technology has already been in trials with more than 30 operators worlwide. NSF Funds Smart City Projects across U.S. The National Science Foundation (NSF) announced nearly $40 million in grants to support Smart City projects around the U.S.
"NSF's investments are helping to cultivate increasingly smart and connected communities for the future," said NSF Director France Córdova. "The effective integration of networked computing systems, physical devices, data sources, and infrastructure, all with humans in the loop, is improving the quality of life for people all across the nation." 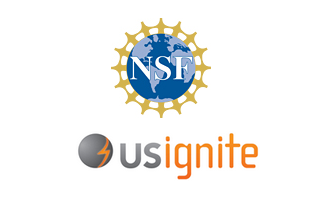 Approximately $12 million for new projects funded through US Ignite to support research leading to prototype applications that leverage gigabit and advanced networking connectivity and impact multiple national priority areas, including healthcare, energy, transportation, manufacturing, education and learning, and public safety. The awards will also build "living labs" that provide the support needed to scale up these prototype applications across cities and regions, leading toward an ecosystem of smart and connected communities. Approximately $10 million in new Cyber-Physical Systems (CPS) research projects with a focus on Smart and Connected Communities and the Internet of Things. More than $3 million to support the creation of a new instrument--the Array of Things--in Chicago that will be the first research infrastructure to allow researchers to rapidly deploy sensors, embedded systems, computing and communications systems at scale in an urban environment. Nearly $2.5 million to enhance the design and operation of efficient, secure and Critical, Resilient, Interdependent Infrastructure Systems and Processes (CRISP) that provide essential goods and services in the context of cities and communities. $2.5 million to enable NSF-funded researchers to participate in the National Institute of Standards and Technology Global Cities Team Challenge. Approximately $2 million in new Smart and Connected Health research projects to accelerate the development of next-generation health care solutions to enable patient-centered care and wellness that extend to the home, workplace, and community. $375,000 to establish a Research Coordination Network to stimulate novel international research on how to integrate data from physical sensors, social media and other sources. Nearly $4 million to support academic and industry partnerships through the Partnerships for Innovation: Building Innovation Capacity program that facilitate integration of breakthrough research discoveries into human-centered service systems. 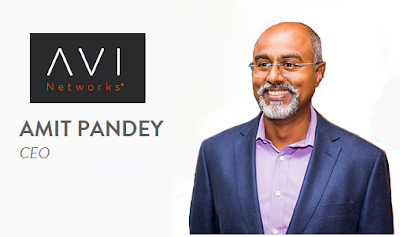 Avi Networks, the next-gen ADC company, appointed Amit Pandey as its, new chief executive officer, succeeding co-founder Umesh Mahajan, who now takes on the role of Chief Strategy Officer. Pandey spent nearly a decade at NetApp in a wide range of executive positions, and followed that with two successful stints at startups - first as CEO of TerraCotta that was acquired by the European software giant, Software AG and next as CEO of Zenprise that was acquired by Citrix. 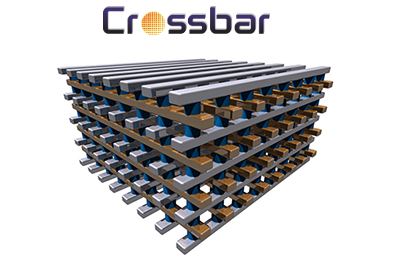 Crossbar, a start-up based in Santa Clara, California, raised $35 million in Series D funding for its Resistive RAM (RRAM) technology. Crossbar said its RRAM technology is based on a simple device structure using CMOS friendly materials and standard manufacturing processes. It can be stacked in 3D, making it possible to combine logic and memory onto a single chip at the latest technology node. Crossbar RRAM’s low power, small size, high performance and low latency make it an ideal memory solution for a wide assortment of applications, from very small devices such as wearables and connected devices for the Internet of Things (IoT), to very high capacity, very fast SSDs in cloud data centers. Crossbar is currently in beta testing. Crossbar’s Series D financing closed on August 26th, 2015, led by new investor, Tyche Partners. Other investors included Artiman Ventures, CBC-Capital, Cheerful Link Ventures, Correlation Ventures, Kleiner Perkins Caufield & Byers, Korea Investment Partners, Northern Light Venture Capital, Oriza Holdings, SAIF Partners, Tao Invest and the University of Michigan. This brings total funding to $85 million. Broadcom introduced a Global Navigation Satellite System (GNSS) chip for Internet of Things (IoT) and wearable devices. The device handles thes bulk of the signal processing by calculating position, velocity and time (PVT) on-chip, delivering significant system power savings. Zayo plans to double the size of its Miami data center by early 2016.
zColo, which is the data center and colocation business of Zayo Group Holdings, provides colocation and interconnection services at the Miami data center for some of Zayo’s largest customers, including top content and gaming providers. Zayo developed the center in downtown Miami as a key interconnection hub, partnering with Netflix and Host.net to form the Florida Internet Exchange (FL-IX). This new exchange allows content providers, ISPs and enterprises to exchange traffic in an open and transparent environment. FL-IX connectivity is provided through Zayo’s Miami data center and provides an important part of the interconnection ecosystem. 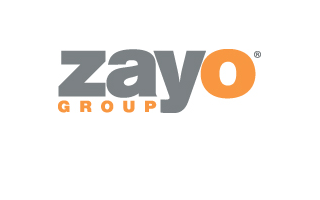 Zayo’s zColo U.S. footprint totals 36 facilities and more than 480,000 square feet of billable space.